My new saw bench will be used with for sawing boards the traditional way—by hand. And yet I built it entirely with power tools: table saw, compound miter saw, and band saw. In my defense, my new Lie-Nielsen 7 tpi rip saw has not arrived yet. And using a crosscut saw to rip boards....well, it's just not done. So I was forced to use power. Either that, or I was being lazy. Sometimes you just want to build an instant gratification project—one that doesn't have to be pretty, or sanded, or have close tolerance joinery. One that can be designed, sawn, and banged together with hammer and nails in 2 hours. 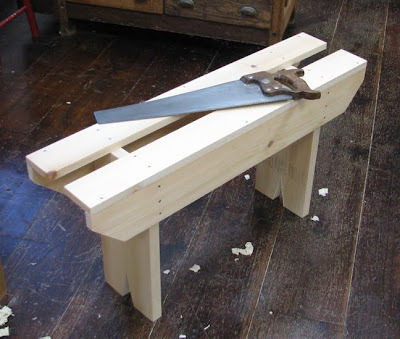 I searched the internet this morning for saw bench plans and settled on one built by Dan Klauder, who found inspiration in Alex Bealer's Old Ways of Working Wood. Now I just have to wait for the arrival of my new saw to give it and myself a workout. Sometimes with tools and projects it's the old "chicken or the egg" dilemma! How do you make a saw bench when you don't have all the right saws? You use what you have! My mantra is mostly: worry less about the tools and worry more about design and the finished product. OK, there's another day left for the weekend. Make a partner bench to hold the infeed / outfeed for longer rips. Why you preferred to use nails instead of screws? Is a functional or practical choice? Doug, that's exactly why I had to use power tools--thanks! Bill, that's a wise mantra. Bob, great advice. I made this the same height as another little bench in my shop, thinking they'd make good saw horses. Every once in a while, I plan ahead. Auguste, that was just personal preference. I like the look of nails over screws. No need to make excuses for using a power saw. They were invented to save us time and effort. Nothing wrong with that - leaves more time for the fun stuff. I don't know too many people who would say that they enjoy ripping long boards by hand. Nice bench by the way. Thanks for your website as well. I really like checking in to see what's happening in Hultmanville. Could have sworn you left with a wide variety of rip saws from Tom Law, this past spring at the Patina gathering!!! Maybe you're just saving your arm power for the upcoming boring contest? I'm unsure yet about WIA--depends what work has in store for me! what is attractive about this WIA is the handsaw content! Could it be that our profession/hobby is entering major acceleration to the already started handsaw renaissanse? I am hoping to be there, at least to meet Mike Wentzloff. I now have three of his saws, including the Disston #16Mike posted pictures of in WoodCentral and WoodNet(? )a month or so back. I agree completely. I want to get started on a carpentry project or woodworking of some sort but I don't ahve the space for it yet. I do enjoy watching DIY shows on tv like THIS OLD HOUSE. Tony, a friend and I were just having this conversation. There seems to be no lack of choice in new handtools, including handsaws. And you can't go wrong with many of them. Sure wasn't that way 30 years ago, or even 20. Did you build this with all 4/4 wood? Dpmohne, the top and sides are just .75", but the legs are 1.125". I would have preferred to use thicker wood for the top and sides as well, but didn't have enough in my shop. Thank you, I wasn't sure if my eyes were playing trick on me or not. Michael,i have been kicking myself ever since!